If you look for an easy but interesting blackjack variation to play, it is a high time for you to try Perfect Pairs Blackjack: it does not actually differ much from a traditional blackjack though gives more chances to win thanks to some additional bets and payouts. The difference between a conventional blackjack and Perfect Pairs is the following: a gambler has an opportunity to make one additional bet on the fact s/he will have his/her 2 initial cards being THE PAIR. If this bet wins, a gambler gets some more payouts; if not - continue his/her playing with his original bet. The objective and basic rules of Perfect Pairs are the same with a traditional blackjack; it also has some additional rules from such a blackjack game as Vegas Strip Blackjack. Anyway, thanks to its rules difference, Perfect Pairs Blackjack is called to be the unique blackjack variation which has a lot of admirers all over the world. The game is played with 4 or 6 decks of cards. 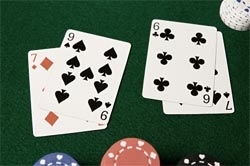 All bets, including a perfect pairs bet, should be made before the cards are dealt. Points got out of your initial hand is Blackjack, and it makes you being the automatic winner. You are welcome to split your pair, double down only once during the game. A dealer has to hit Soft 17. As well as any other blackjack variation, Perfect Pairs Blackjack provides its own strategy for players to have more chances for winning.